In one of my last Blog Posts I explained how you can setup a Lightweight Docker Swarm Environment. The concept, which is already an open infrastructure project on Github enables you to run your business applications and microservices in a self-hosted platform. Today I want to explain how you can monitor your Docker Swarm environment. Although Docker Swarm greatly simplifies the operation of business applications, monitoring is always a good idea. 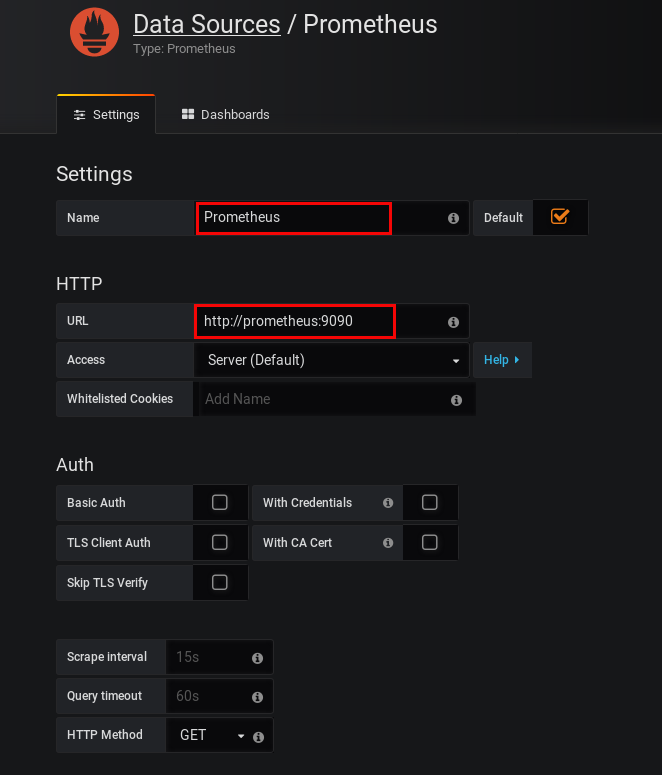 The following short tutorial shows how you can use Prometheus and Grafana to simplify monitoring. Prometheus is a monitoring solution to collect metrics from several targets. 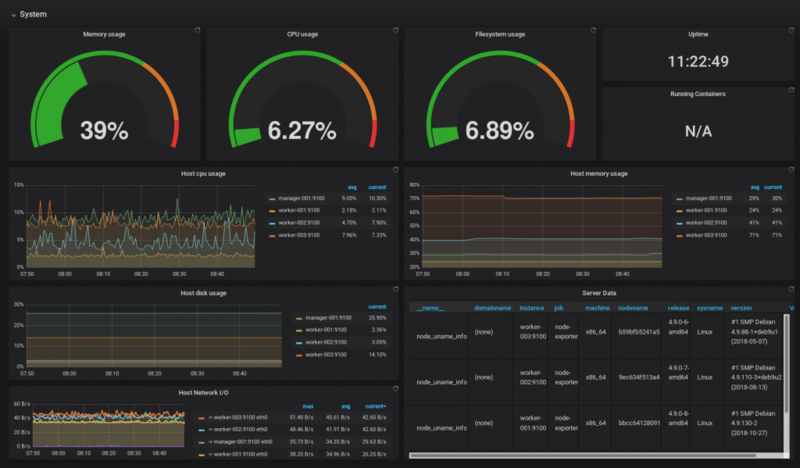 Grafana is an open analytics and monitoring platform to visualize data collected by Prometheus. Both services can be easily integrated into Docker Swarm. There is no need to install extra software on your server nodes. You can simply start with a docker-compose.yml file to define your monitoring stack and a prometeus.yml file to define the scrape configuration. You can find the full concept explained here on Github in the Imixs-Cloud project. The example files can be downloaded from here. Since the docker-compose file is a little longer, I would like to briefly explain the important points now. 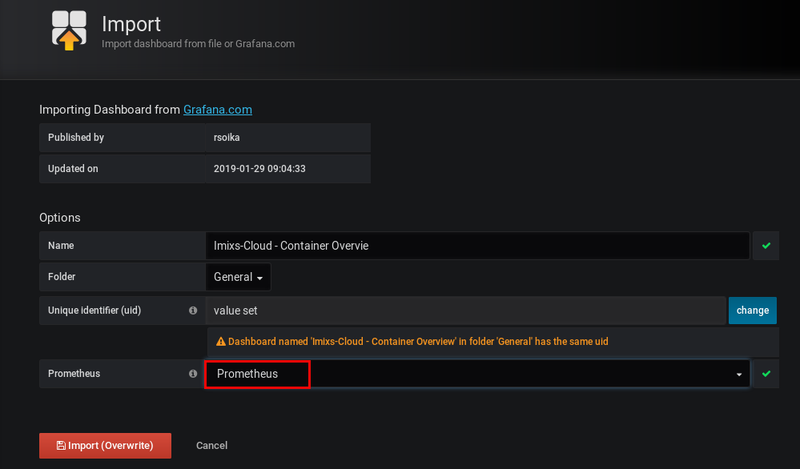 This network called ‘frontend’ is to access the Prometheus and Grafana services form your private network or the Internet. The second network ‘backend’ is used only internally by the monitoring stack. In Docker it is always a good idea to hide as many services from external access as possible. So this is the reason for this second network in the stack definition. This service imports the prometheus.yml file form the host directory management/monitioring/ and exposes the api on port 9090 which is public accessible from our ‘frontend’ network. The ‘backend’ network is for later services. # Hostname of the manager node! You can replace the host name with the corresponding host name from your environment. The node-exporter is only connected to the ‘backend’ network. This means it is visible to the Prometheus service but not accessible from outside. You can add a separate node-exporter definition in your docker-compose.yml file for each docker node which is part of your docker-swarm. 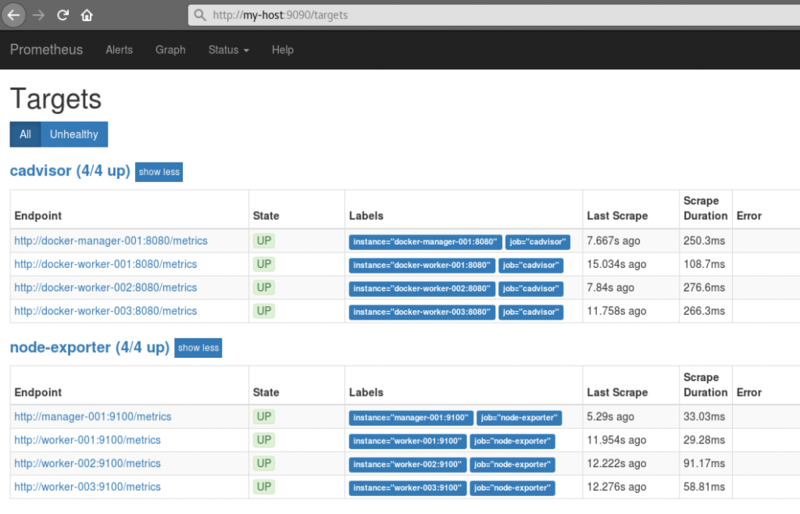 The cAdvisor is the second metrics collector. I provides metrics about docker itself. The service is maintained by Google. # Hostname of the first manager node! Again this service can be defined for each docker node within your docker-swarm network. Take care about the service names here because these are needed later in the prometheus.yml file. The service collects the data from prometheus and provides the graphical dashboard. The service is accessible via port 3000. In the example I place the service here on the manager node from my docker swarm. But you can run the service also on any other node within your swarm network. The important part here is the ‘targets’ section in the job descriptions for the ‘node-exporter’ and the ‘cadvisor’. You need to add all the corresponding service names which you have defined in your docker-compose.yml file here. This is because you need a separate node-exporter and cAdvisor running on each node. In my example I define two nodes for each service – the manager-001 node and the worker-001 node which are part of my Docker Swarm. Monitoring Docker Swarm is easy with the existing services Prometheus and Grafana. You can start you own monitoring stack with docker-compose and only one single configuration file. You will find a complete description about a lightweight docker swarm environment on Github – Join the Imixs-Cloud project! Next PostNext Don’t Miss Eclipse Photon Update 2018-12 for Linux!